Looking for video creativity here — we’re hoping videographers will make counter-announcements using the WMATA random bag search announcements played over the PA system on the DC subway system. We provide one example, but we think you can do better! Now everyone else can listen in too, thanks to the magic of digital recording devices and the tedium of switching one on every time I went into the Metro for weeks on end — except when I forgot to, which was invariably when the announcement would play. The announcement closes, “…and remember: if you see something, say something, and call the Metro Transit Police” at 202-962-2121. The latest from Montgomery County. We’re pushing back against the NDAA; have a look at the resolution — a hybrid of anti-NDAA resolutions developed by BORDC and ACLU. requesting that our Congressman and Senators monitor the implementation of of the NDAA and work for its repeal. 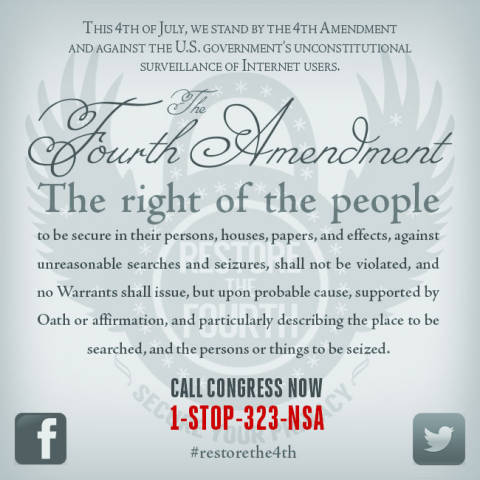 You are currently browsing the Get FISA Right blog archives for March, 2012.